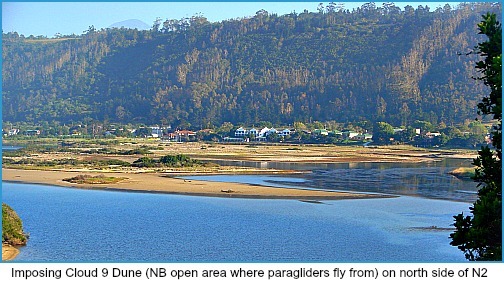 Cloud 9 is an impressive ancient sand dune on the eastern side of the Swartvlei Lake that reinforces the nature oriented character of the village of Sedgefield. 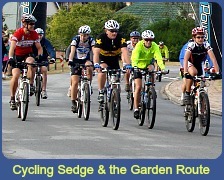 Everyone who visits Sedgefield should take a ride (by car or mountain bike or even day-hike) along the dirt road that begins at Egret Street on the north side of the N2 reached just before the dual carriage-way ends as the road leaves Sedgefield in the direction of Knysna. 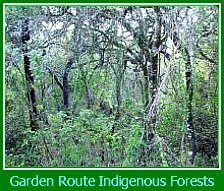 Initially tall trees and thick undergrowth block the view as one travels up the dune road, but eventually one arrives at a cleared area. 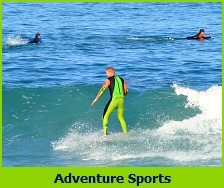 It gives one spectacular panoramic views over the whole town, the island, over the sand dunes running behind the beach to Gerickes Point and to the Indian ocean. 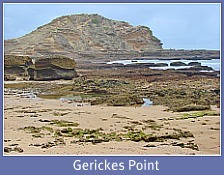 One can see how the Swartvlei estuary winds around the island and curves eastwards to run parallel to the seaside dune until a gap in it allows the river to flow into the sea. 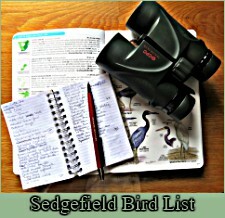 It is a breath-taking sight that completely transforms peoples’ perceptions of Sedgefield. The dune known by locals as Cloud 9 in reality extends from Langvlei in the west to Goukamma River in the east, a distance of about 24 kms and is around 350 000 years old. The dune has been breached and eliminated over a distance of about 4 km in an area occupied by much of the northern part of the Swartvlei which is a large and fairly deep lake. 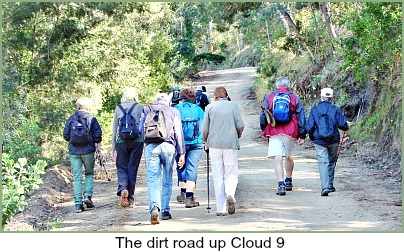 Cloud 9 is the second or central of three dune fields or cordons that occur between Wilderness and Knysna forming the so-called Wilderness embayment. It is a calcified dune, (partly decalcified near surface) with a distinctive grey sandy soil profile which supports large tree growth. 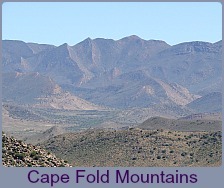 The steep southern face on the N2 side of the dune represents an old sea cliff. 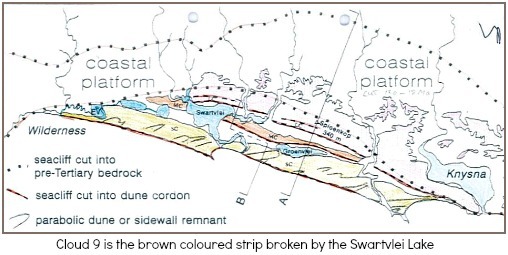 The dotted lines in the diagram shows where the sea has encroached upon the landmass, retreated and then advanced again until it rests where it is today. The different cordons of dunes record these movements that took place over thousands of years. Blankenberg (Blanco) and Elaine Watney arrived in George from Tzaneen in 1947. 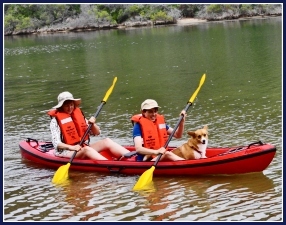 A new coastal road had just been built between Knysna and George and as a result they bought the vacant but long-established Sedgefield township from the Thesen’s. They decided to build their house atop Cloud 9 and for nearly four years toughed it out in a small bungalow at the base of the dune while a road was first arduously built to the top using a span of oxen that then had to laboriously haul up the materials to build the house. 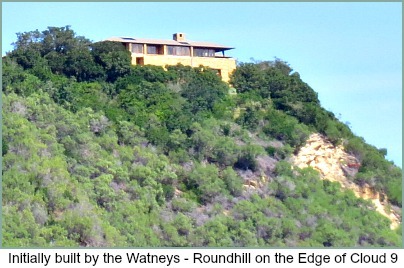 The result was “The Bluff” (now Roundhill), a house that had an extraordinary unparalleled view of the Swartvlei and surrounds. Unfortunately it was short lived for the “masters of all they surveyed”! Blanco died in 1952 barely a year after the Watneys moved into their hilltop home and Elaine found the sand road difficult to negotiate and the place remote, living there on her own. 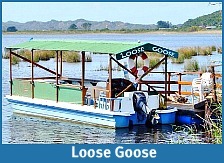 Before long, she moved into the village to a house bordering on the Swartvlei. 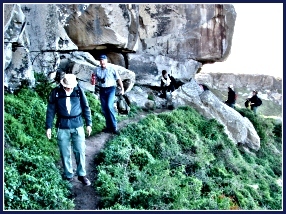 In 1958 Colonel Spencer Chapman, an adventurer and, mountaineer with a distinguished wartime career, established Field and Vlei Adventure Trust in the area of the Watney’s base bungalow when he held the very first adventure course on the north-western side of the dune on the banks of the Swartvlei. 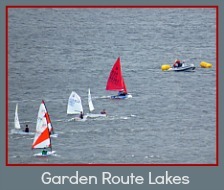 By 1983 there was a selection of prominent people serving on the committee, Jack Case OBE – Patron, Sir John Killick – Chairman, Peter Orgen – President, Ron Dugmore – Vice Chairman, Tim Balchin – Secretary and Bob and Kitty Charlton. Twice a year, summer and winter, a three week course was sponsored by Service Clubs or businesses for Std 8 & 9 school children. Locals were invited on occasion to view aspects of the challenging program and to attend the final day when winners were given awards and participants obtained their certificates. 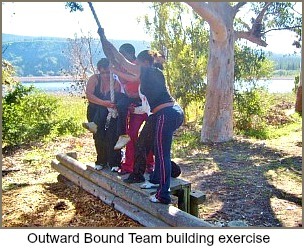 In later years, Outward Bound ﻿took over from Veld and Vlei and have since sold it but still rent the premises from the new owner for various local team building exercises. 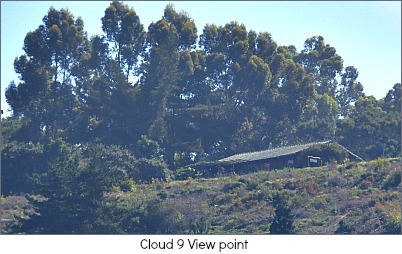 Cloud 9 was sold off in large tracts of land equivalent to smallholdings and a number of Eucalyptus plantations now cover a large part of the southern slopes. Not many houses are visible from the Sedgefield side except the one first built by the Watneys that has since been enlarged and another where the area is cleared in front of it and from where the wonderful views can be seen and photographed. 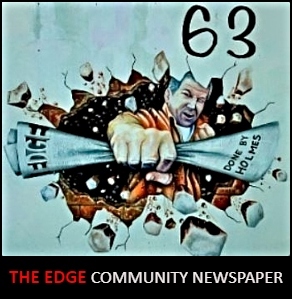 One prestigious owner of a piece of land, was Michael O’Dowd “a man of ideas” who worked for the Anglo-American Corporation for forty years and who, for a decade before his retirement, served on its board and that of the De Beers group. 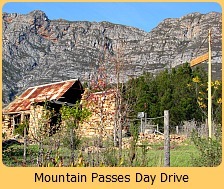 He retired to Sedgefield where he built a house for himself and his wife in a secluded spot on the north side of Cloud 9 overlooking the Hoogekraal and Karatara tributaries that feed into the Swartvlei. 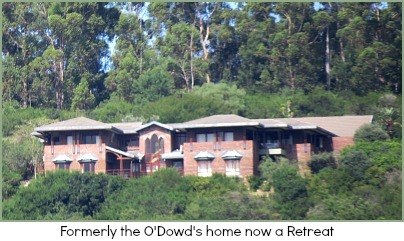 After he passed away in March 2006 at the age of 76, Cathy, his daughter inherited the property. She was the first woman mountaineer to summit Mt Everest from both the south and north sides. Living abroad, she put the house on the market and it is now a Retreat. 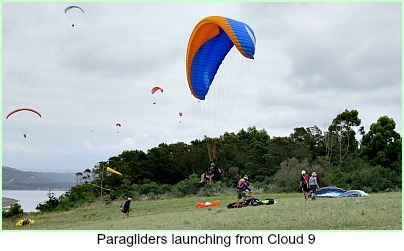 The owner of "Sedgeview", Michael Rohwer on the South side of The Dune has given local paragliders permission to launch from his property. 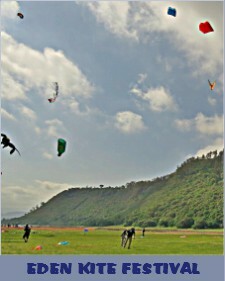 On a good day, it is possible to see up to thirty paragliders catching the thermals. 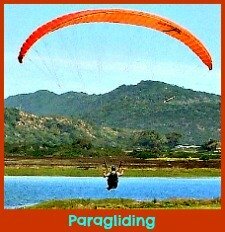 Paragliding is a popular pastime and once hooked it is essential to be available when the skies beckon. In recent times, a plan was put forward to the Knysna Municipality for a major development on the south side facing the N2. This was shot down in flames by zealous Sedgefielders not willing to allow the dune to be scarred by a large housing scheme. There were major concerns about water supply, waste disposal and the long-term stability of the dune to cope with such a development. It is very much a sand-dune and a young one in geological terms. So for now Cloud 9 is very sparsely and unobtrusively inhabited which is the way the locals like it! It presides over the village as a megalithic sentinel clad extensively with some indigenous and a lot of alien vegetation in the form of an almost unbroken forest of huge Eucalyptus trees intercepted with bands of pines. 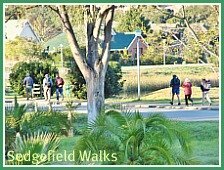 A natural asset we are inclined to take for granted Cloud 9 endows Sedgefield with a sense of peace and serenity that is unique. Morris Viljoen for his notes on the geological formation of Cloud 9. 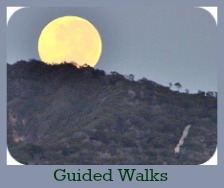 Information on Veld & Vlei taken from the notes of the late Wynne Humphries.